K-Designers: Looking to enjoy the great outdoors just a little longer this year? Looking to enjoy the great outdoors just a little longer this year? Ever been outside and a sudden rain storm send you running for cover? Ever felt like you wanted to just turn the sun down like you would a thermostat? Depending on where you are you might experience one or both of these situations. Enjoying the outdoors doesn’t mean you have to settle. 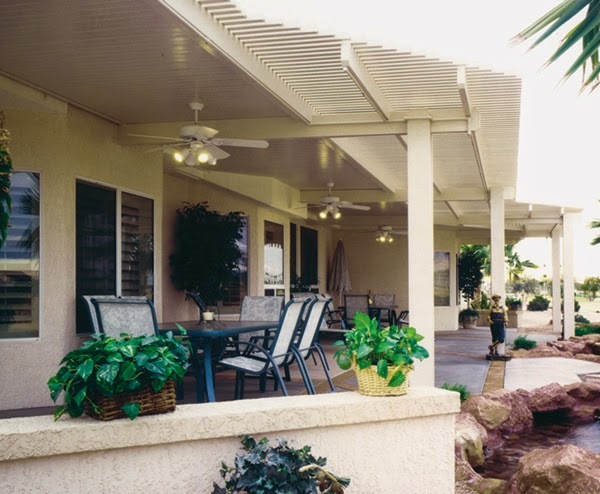 Patio covers or free standing shade structures can help you tame Mother Nature. K-Designers has a perfect solution for your shade and weather needs, America’s Dream Koolshade. It’s a variable coverage product. Meaning you can have full coverage with solid sheets or variable spaced beams for different levels of shade. You can even vary the amount of coverage from area to area. Completely up to you. Koolshade is an enamel finished aluminum with an embossed wood grain. It comes with choices in end pieces and column styles to give your cover a bit of individuality. Don’t let Mother Nature dictate how and when you enjoy the outdoors. Call K-Designers to get your free quote 800-728-3902 or visit us online at www.k-designers.com.